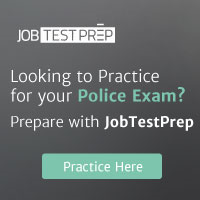 No matter the career you choose in the criminal justice field, you are expected to go through a hiring process. The first step to becoming an officer is a series of written tests. After performing adequately on the tests, you undergo a background check and medical examination. Upon passing these requirements, you may be sent to the police academy. Many police academies are about six months long. At the city, county and state levels you may attend training during the day and return home at night. At the federal level, you are require that you stay overnight during your training, but you often have weekends free. All police academies reimburse you for time spent training.